Why drink regular beverages when you can slap one of these Scary Bottle Labels onto the bottle and drink something that looks and sounds infinitely more sinister? Each pack contains 8 labels to transform your drinks into true horror beverages. Each of the 8 labels is a stick that can be applied over a bottles existing label or to the bottle itself to change its name and label. Included in this pack are labels for drinks like Biohazard, Rot Guts, and Blood Thinner. 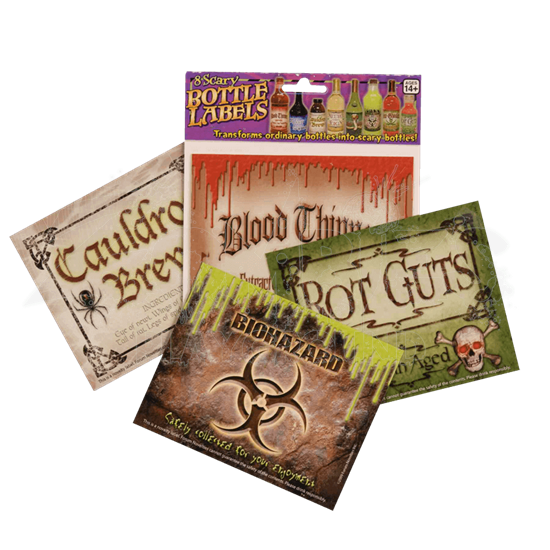 Many of the labels feature impressive detailing, including the eerie Cauldrons Brew label, which states that it is made from classic witches ingredients, including the eye of a newt, a lizards tail, and spider legs! Thanks to these Scary Bottle Labels, you do not have to keep drinking mundane beverages, because now you can keep your labeled bottles and mix in a few wild additions that will leave onlookers speechless, especially when they see you drinking from a bottle labeled Biohazard.